After a pleasant half day in Plymouth, a tropical storm crashed in and hampered our efforts to see some things in the area. We still got a lot done, though. The day we spent on Cape Cod had the nastiest weather. It never cleared up for very long during our first day, which was punctuated by an umbrella-ripping horizontal rain at times. This is a great place to visit, however! Mystic Seaport, Connecticut was a step back in time- a fascinating place that deserved more time than we had to give. 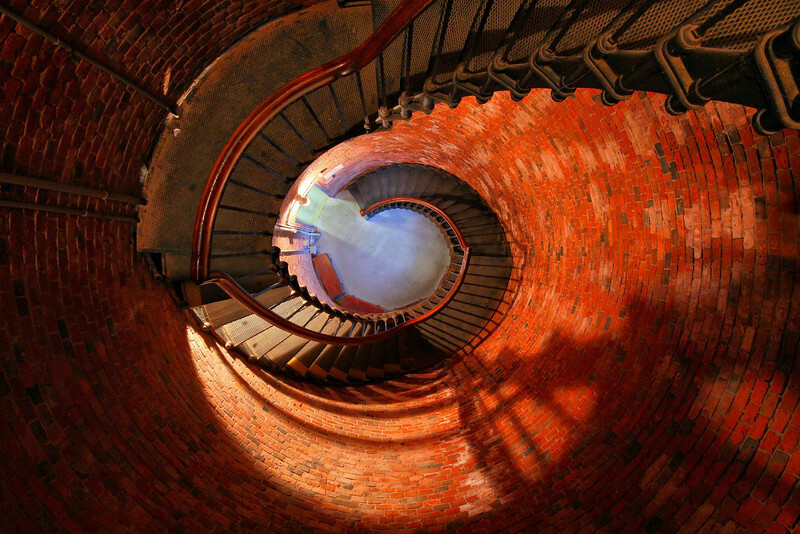 Stairwell inside Highland Lighthouse, in North Truro, Mass, on lower Cape Cod. Outside at the moment was a tropical storm, remnants of a hurricane Earl , with horizontal rain and umbrella-ripping winds. Photography of the lighthouse from the outside was not practical while we were there.